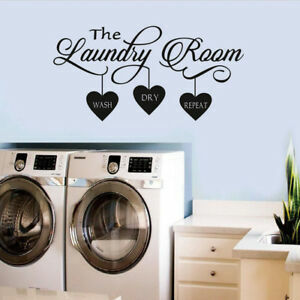 These stickers are a cute way of letting our guests know where the laundries are. We are very happy with them, and the way they look. They stand out, they are fun, and they are easy to apply to the wall. Great product! I had hoped this would come in better packaging. It ships in a rolled package and that makes it hard to unroll and put on your wall. Nice quality but bad shipping method. If you do not mind unrolling the vinyl - then go for it. It is cheap enough to try it.